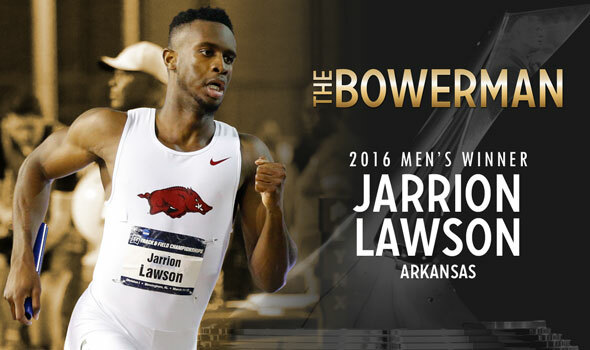 ORLANDO — Jarrion Lawson is the men’s winner of The Bowerman. The former Arkansas standout won four NCAA titles in 2016, including a historic three at the NCAA Division I Outdoor Track & Field Championships. He is the first Razorback to win collegiate track & field’s highest individual honor, which was handed out Friday night at the Orlando Grande Lakes Resort. Lawson joins a prestigious fraternity of former male winners, headlined by two-time Olympic gold medalist and two-time world record holder Ashton Eaton (2010). Galen Rupp (2009) and Derek Drouin (2013) also won two Olympic medals, while Deon Lendore (2014) captured bronze at the 2012 London Olympic Games. What Lawson did at Historic Hayward Field in June was nothing short of remarkable. Lawson became the first man since Jesse Owens in 1936 to win the 100, 200 and long jump titles at the same NCAA meet. The Razorback star also ran a leg of the team’s 4×100 relay (which finished 3rd) and in turn, shattered the modern-day scoring record. Lawson faced tough competition for The Bowerman as Texas A&M’s Donavan Brazier and Oregon’s Edward Cheserek were also finalists. Brazier broke Jim Ryun’s 50-year-old collegiate record in the 800 on its golden anniversary, while Cheserek — the first three-time finalist in the history of The Bowerman — won five NCAA titles (four individual, one relay) and was the first man to sweep the distance slate clean (3000-5000-DMR indoors, 5000-10000 outdoors) in seven years. This is the third consecutive year that a male athlete from the SEC won The Bowerman. Lendore started the trend in 2014 and former Florida horizontal jumper and 2016 World Indoor gold medalist Marquis Dendy continued it last year. Dendy was there Friday night to hand off The Bowerman to Lawson.